Flight to Izmir . Pick up from airport and depart for Izmir . We will visit St. Polycarp Church at Izmir( Smyrna) continue to Pergamum . Visit to the Asclepieion , one of the major healing centres of antiquity , Acropolis where the monumental buildings or herons donated by the kings of Pergamum during the Hellenistic period. The Temple of Serapis , built for the Egyptian Gods in the 2 nd AD . and called as the Red Courtyard and dedicated to St. John . Stay overnight in Pergamon . Breakfast served at the hotel . Depart from Hotel and continue to ; Thyatira where remains include a temple and large church . Then visit Philadelphia with its famous Church of Philadelphia , an important for the spreading of the Christian faith . After lunch , we continue on to Sardis , the wealthy capital of the ancient Lydian Empire and one of the most amazing sites in Turkey . After visiting Sardis , we will head to Pamukkale . Check in to your hotel and stay overnight in Pamukkale . Breakfast served at the hotel . Depart from Hotel and continue to Ancient City of Hierapolis and the travertines . Lunch in Pamukkale . After lunch drive to Laodicea which is mentioned in revelations by St. John and in ancient times was known as “The City of Compromise”. After visiting Laodicea drive to Ephesus. Overnight in Kusadasi. 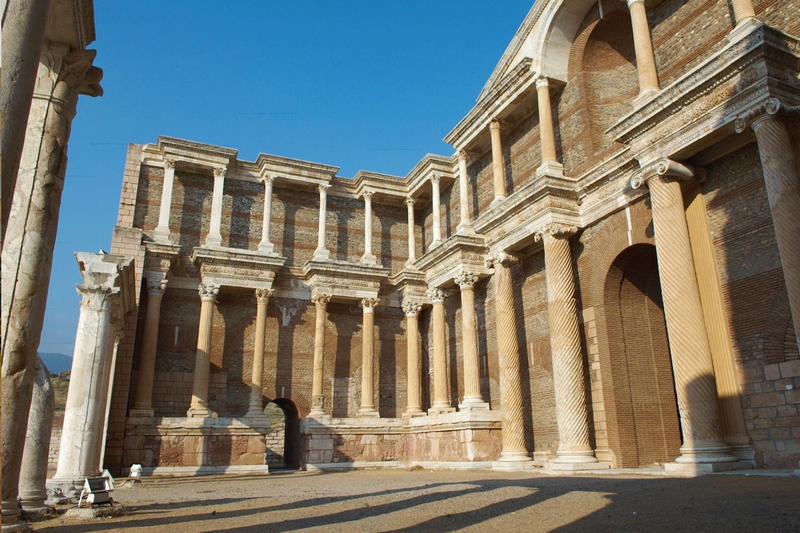 Ephesus Ancient City - Enter through the Magnesia Gate and begin a slow, downhill walk with your guide into the ruins of this Roman provincial capital. Your route takes you past the Odeon, The Baths of Varius , Prytaneion, Agora , the Temple of Hadrian, the Fountain of Trajan and the Great Theater. The theater had seating for 24,000, which was the site where it is believed St. Paul preached to the Ephesians and is used today for a local spring festival. House of Virgin Mary - The Vatican has recognized this small house in the Solmissos Mountains as the final resting place of the Virgin Mary. A small shrine dedicated to St. Mary was found when the ruins of the house were first discovered. The Temple of Artemis, which had been built at first during the Archaic period, today it's known one of the Seven Wonders of Ancient World. End of tour transfer to Airport . Flight to Istanbul.